Chrysler Force OEM ignition switch. Short barrel style for control box mount. Chrysler Force OEM ignition switch. Long barrel style for mounting in dash. 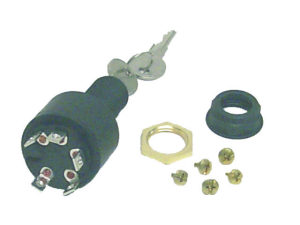 JOHNSON EVINRUDE 3-POSITION,OFF-ON-START, 5 SCREW TAB TERMINAL MAGNETO IGNITION SWITCH Polyester housing is rust proof and corrosion proof. 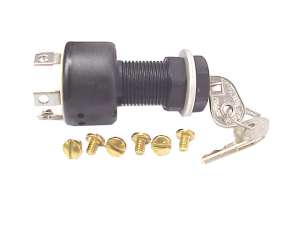 Supplied with brass back up nut and hexagonal black plastic face nut. Requires 7/8" mounting hole in panel. 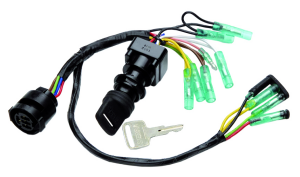 Ignition rated 15 Amp @12 VDC. Solenoid 30 Amp @ 12 VDC. 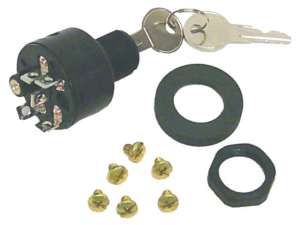 JOHNSON EVINRUDE 3-POSITION IGNITION SWITCH, OFF-ON-START, PUSH TO CHOKE IN START POSITION, 6 SCREW TERMINALS, 5 TAB 1 THREADED BOSS. Polyester housing is rust and corrosion proof. Supplied with hexagonal black plastic face nut. Requires 7/8" mounting hole in panel. 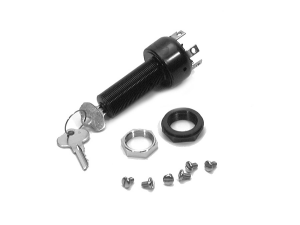 Ignition rated 15 Amp @ 12 VDC. Solenoid rating 30 Amp @ 12 VDC. Choke 7 Amp @ 12 VDC. JOHNSON EVINRUDE NEW STYLE IGNITION SWITCH, bullet type connectors and kill switch lanyard. MERCURY MARINER 3-POSITION, OFF-ON-START IGNITION SWITCH, PUSH TO CHOKE IN START POSITION, 6 SCREW TERMINALS, 5 TAB 1 THREADED BOSS. Polyester housing is rust and corrosion proof. Supplied with hexagonal black plastic face nut. Requires 7/8" mounting hole in panel. Ignition rated 15 Amp @ 12 VDC. Solenoid rating 30 Amp @ 12 VDC. Choke 7 Amp @ 12 VDC. MERCURY MARINER 3-POSITION,MAGNETO STYLE IGNITION SWITCH, OFF-RUN-START, PUSH TO CHOKE IN START POSITION. Exact OEM replacement ideal for DFI, EFI and MPI engines. Heavy duty potted construction. Minimal bleed per circuit. 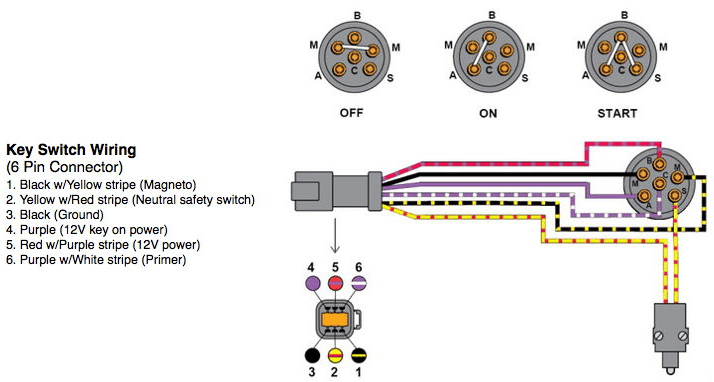 MERCURY MARINER 3-POSITION,MAGNETO STYLE IGNITION SWITCH, OFF-RUN-START, PUSH TO CHOKE IN START POSITION. Exact OEM replacement idea for DFI, EFI and MPI engines. Heavy duty potted construction. Minimal bleed per circuit. 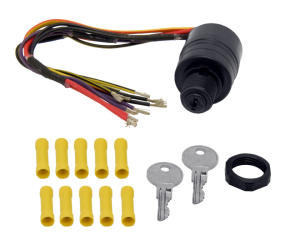 Yamaha control box mount ignition switch for 2 & 4 stroke engines. 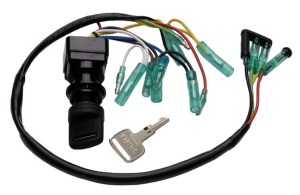 Allows minimal circuit bleed over making it ideal for use with popular DFI, EFI, and MPI engine packages. 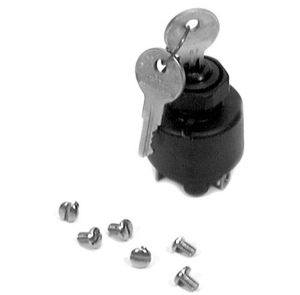 Rubber molded key combines OEM appearance and feel with a solid secure grip in all conditions. Colors on wires match factory color codes. 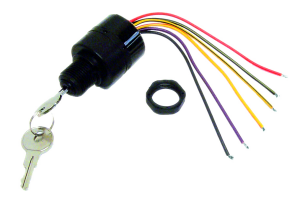 Yamaha dash mount ignition switch for 2-stroke outboard motors, dual engine application. Colors on wires match factory color codes. 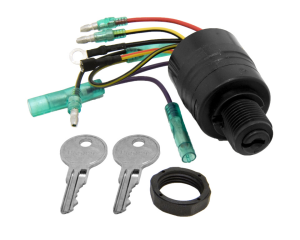 Yamaha control box mount ignition switch for 2 & 4 stroke outboard engine applications. Push to choke. Factory color coded wires.